From left are Garbrion Johnson, Debra Hghes (ASHS band director), and De’Shun Iverson (recipient). 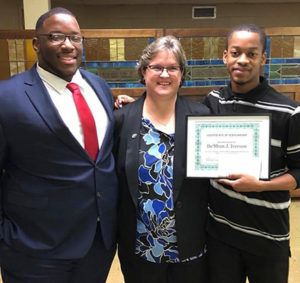 At the recent Americus-Sumter High School (ASHS) Band Banquet, the Gabrion Johnson Pay It Forward Band Scholarship was presented to its first recipient — De’Shun Iverson. Johnson was drum major of the ASHS Band in 2015-2016, and a 2016 Honor Graduate of ASHS. He is a junior financial planner major at the University of Georgia. Johnson said he had some great opportunities while in school in Americus and he wanted to pay it forward. His goal is to encourage others to do more; he wants more of the students at ASHS to branch out and go to college. He wants to give a little money to help with their college career. He has even given his phone number if they need help with understanding the financial aid process. His hopes are to help students learn about the different types of financial aid and loans that are out there and that hopefully when they graduate from college they are not deep in debt. It was not until after he started at UGA that he learned so much about life, about living on your own. He wants to help students not make some of the same freshman year mistakes as he has, and to be ahead of the pack. In January, Johnson reached out to the ASHS’s Band Director, Debra Hughes, and discussed his idea of wanting to start a scholarship and giving back to his school and community. They worked together to create the scholarship application which included a 500- to 750-word essay on the topic “How to pay it forward when you are able”. He felt that the band students would be a good starting point, because the band program impacted his life in many positive ways. The only other requirement for the scholarship was that the applicant was going to college. The applications were submitted in April and the scholarship was awarded at the Annual Band Banquet. De’Shun Iverson was surprised when his name was called. Johnson said when he was reading over the essay, it was like he was looking in a mirror. He and Iverson have the same values, and they both want to make a positive impact on the youth in their community. One of the statements in Iverson’s essay was, “In order to make a change you must address a concern by being a positive influence on the children of the future.” Johnson has asked that the scholarship recipient contact him sometime during his first year in college and tell him a way he has paid it forward. Johnson said it could be as simple as offering encouraging words to a classmate. Motivation is worth more than a dollar sign. Johnson said that he decided to “put words into action” and to begin now paying it forward.